In a Nutshell: By putting customer needs at the forefront since 2000, CustomInk has made ordering custom T-shirts and apparel an enjoyable process. The company’s online Design Lab features hundreds of fonts and thousands of templates and pieces of art that make creating a business logo or unique design an easy, intuitive experience for users. More established companies with pre-existing logos can upload them to the platform and have items branded to make their businesses stand out. For the less creatively inclined, the company’s knowledgeable service representatives go the extra mile to lend assistance to those who need it. 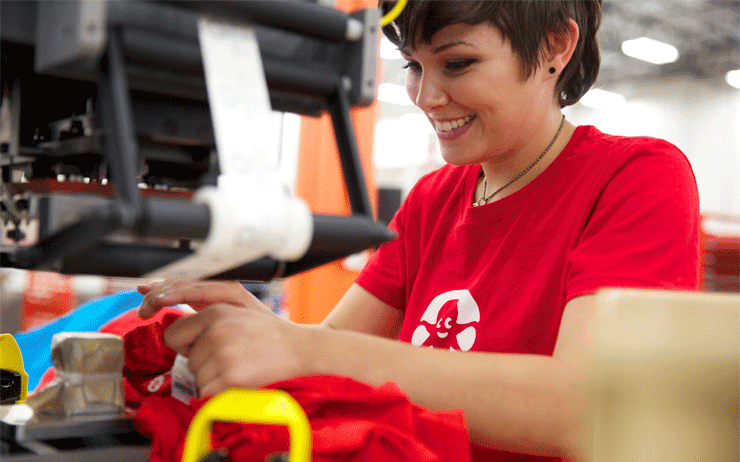 CustomInk believes the process of customizing apparel and accessories should be fun and easy, and more than 75 million T-shirts shipped prove it’s lived up to that promise. In the endless search for retail strategies that improve customer experience, several lessons can be learned from a custom apparel company that started on a couch in northern Virginia. Specifically, a belief in the Golden Rule — or treating customers how they themselves would want to be treated — has translated to high customer satisfaction rates at CustomInk. What started in 2000 as a 10-person team committed solely to easing the process of designing and ordering custom T-shirts online has now grown to a team of 1,600 employees (or Inkers, as they like to be called). In the years since, CustomInk has extended its reach to offer more than 1,000 types of apparel and accessories. Amanda Hanlon, Director of Merchandising at CustomInk, told us Inkers put themselves in their customers’ shoes. CustomInk specializes in making events more memorable, and you’ve probably seen their custom products unifying groups at events like family reunions, sports tournaments, or bachelorette parties. CustomInk also has much to offer for businesses that are looking to build camaraderie or stand out in the local community. Imagine you’re starting a coffee shop in your hometown. Among your early business tasks are creating a memorable logo and outfitting your employees with T-shirts or embroidered polos that prominently display your branding. You’ll also want to organically create buzz throughout the community by producing other merchandise with your logo to sell or give away at the coffee shop — maybe hats, tote bags, or coffee mugs. All of this is available through an online Design Lab that includes thousands of templates, thousands of pieces of art, and hundreds of fonts. Or if you’re less of a do-it-yourselfer, CustomInk’s hands-on sales representatives can provide design assistance. The company’s goal is to make it fun and easy to create apparel or accessories to help your business or event stand out, and the sales reps will spend hours helping you with a project if that’s what it takes. While the coffee shop just starting out certainly has much to gain by using CustomInk to get noticed, the retailer runs the gamut with products for companies of all sizes — from larger companies welcoming new employees to tech companies creating giveaway items that create buzz at trade shows. Amanda told us a recent survey of CustomInk business customers revealed that an overwhelming number of business owners are using branded apparel and accessories as a part of their onboarding process for new hires. More established companies can forego the Design Lab process and upload their logos to the site, and CustomInk has a team of production artists who ensure their logo looks great on a variety of items. Plus, the company’s service representatives are trained in design and work hard to educate customers on choices available for the price point and product category that fits what they’re looking for. “We have over a thousand products on our site, but we never want a customer to feel overwhelmed,” Amanda said. “Our job is to expose customers to all of the options and land them on the right product that matches their needs. After the Golden Rule and the company’s second core value of taking ownership, CustomInk’s third priority is innovation, which has led to growth in both company size and range of products and features on the site. Nearly every new idea or new offering on the site can be traced back to customer demand. “We’re continuously listening to our customers and trying to evaluate where we can continue to build that customer relationship, and how we can help people in their search for custom apparel,” Amanda said. Customer demand led to opening brick-and-mortar storefronts in its home state of Virginia after more than a decade of operating solely as an online company. “We are trying to merge the technology that we’ve established as a leader in the industry with the face-to-face conversation that some customers prefer,” Amanda said. 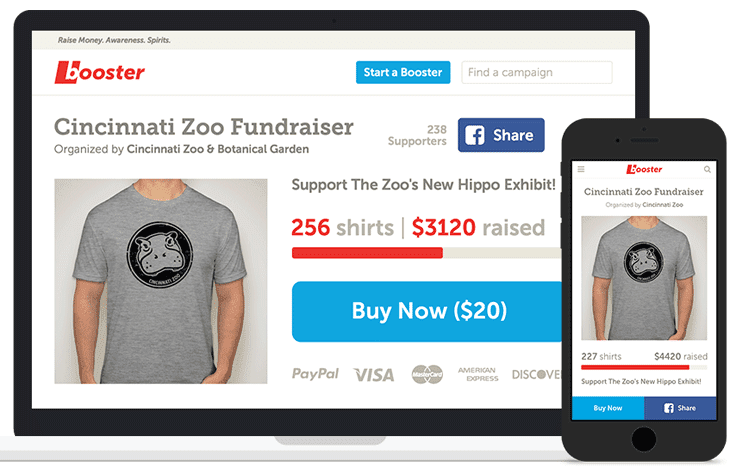 CustomInk’s launch of Booster gives customers the tools to successfully raise funds by selling T-shirts. Other innovations include the launch of Booster — an online platform that allows users to create and promote custom products for fundraising purposes — and the creation of its Group Order Form. Anyone who has ever organized large group orders of T-shirts for a sports team or event knows the hassle that comes with tracking down everyone’s preferred sizes and money. The Group Order Form allows an organizer to be a hero instead of an annoyance, sending a link to everyone so they can specify their size and payment method individually before the group order is placed. From the coffee shop just starting out to the enterprise-level tech company turning heads with branded gear at a conference, CustomInk has a range of design and product options that meet a wide variety of business needs. Part of CustomInk’s commitment to innovation is showing its customers how fun and easy it can be to do more than they think is possible. 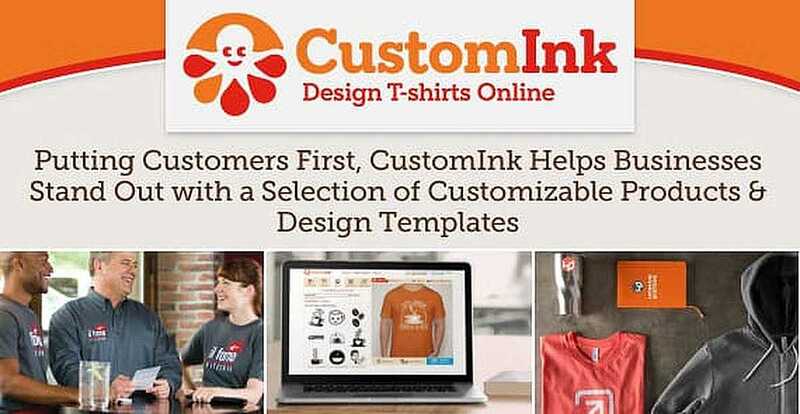 CustomInk’s Inkers work hard to make customers look great by providing high-quality products. This commitment is apparent anytime a customer calls or emails someone at CustomInk for consultation on a project. Sales representatives are aware of the products and printing styles available for each price range and will go the extra mile to work with customers for as long as it takes for them to feel confident about their designs. And although most customers will find something that matches their end goals, the Inkers won’t rest until their clients are pleased. “At CustomInk, our goal is to give customers the best designing experience, and if you can’t find what you’re looking for on our site, we will work tirelessly to make sure that you’re satisfied,” Amanda said.